Hello my sweet readers! Autumn is here and winter not yet here but I am totally ready for it. I can smell it in the air oh my god: sweaters, scarfs, coats, candles, boots, cosy blankets, christmas lights and decorations, sweets...I just can't handle the excitement! 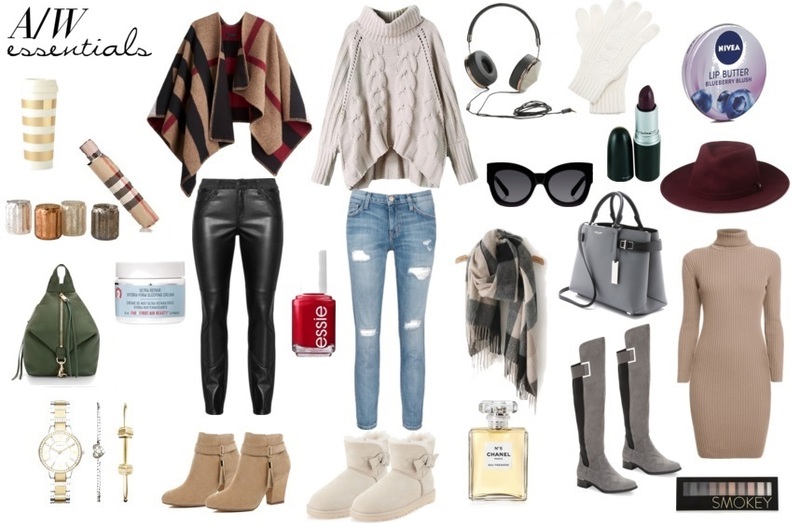 Well due to all this hype around fall and winter seasons I'm doing a collage with all the things that I think are essentials for autumn/winter time, which are basically clothes and accesories as you can see below. If I'd have to say my favourite month of the year it would be, with a hand in my heart, December. No doubt. In December happens everything exciting: christmas, family meetings, holidays, the New year party...and don't forget that you can eat crazy amounts of food and chocolate and sweets and no one is going to judge you. What else can we ask for? In my personal case, it's my anniversary too, so I couldn't ask for more in December. Well that's everything with this post. Maybe some of you are wondering why I've been taking so long to come with a new post. The reason is that I started working in September and it takes almost all of my time. Now, with Christmas Holidays coming I think I'm having more free time so I'll try to work on some other posts for you guys. Thank you all for understanding and for your feedback. xoxo. What are your Autumn/Winter essentials? Do you think I've missed something?